UCU strikes over changes to USS pensions have taken places at 61 universities this week, starting on Thursday morning. Today marked the end of the first of four weeks of planned industrial action. The average academic is set to lose £10,000 a year in the changes to the pension scheme. 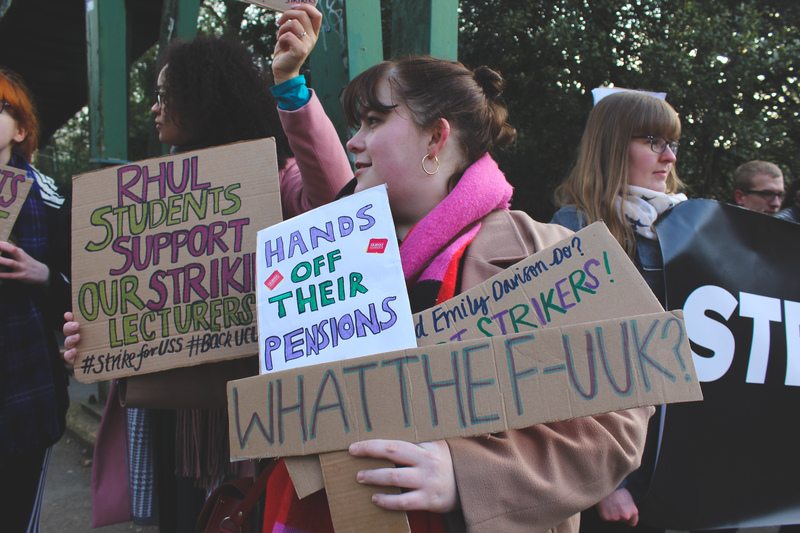 Here is our report on the first week of strike action at Royal Holloway. Thursday’s strike saw a large turnout of lecturers from several departments that contributed to the atmosphere of the entire event. 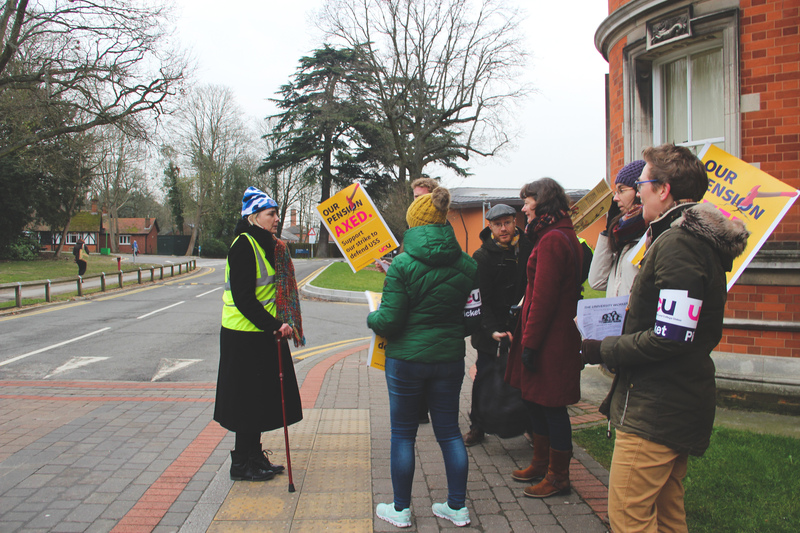 The strike leader, a designated representative of the UCU donning a high-visibility jacket and coordinating the picket line, was quick to discuss the picketing situation with security guards from Royal Holloway. The security guards cited an official law that stated only six people can picket at one time if they are contributing to an intimidating and threatening environment. As our Twitter reporting highlights, both the academics picketing and the students demonstrating were quiet and respectful during the breakfast picket. 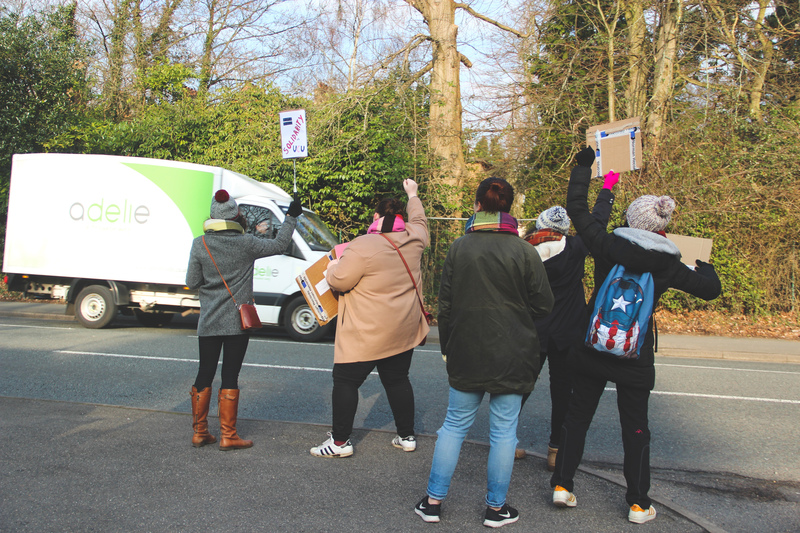 However, security guards were quick to explain that due to Royal Holloway’s entrance being situated on the A30, picketers were required to move inside the college grounds, which is unusual for a picket line, which would normally be outside an entrance. Thus, due to the strikers picketing around the Founder’s Building, they enacted the law “just in case”. There was a lot of contention around this point from both staff and students, as security claimed that only six picketers could be around the entire of Founder’s Building, not just one picket line. Picketers carried UCU signs and handed out flyers to passers-by. Meanwhile, students in support of the strike demonstrated nearby but were required to keep a physical distance from staff. Students also brought homemade signs that had slogans such as “Students Support Strikes” and “What the F-UUK” and urged other students to join them in demonstrating their support. Today saw a large gathering of lecturers and academics picketing by Piggery Gate on Egham Hill and at the backgate leading out to Spring Rise. The increase of picketers today allowed for more entrances of campus to be covered compared to Thursday’s picket line. Not only were there an increase of picketers, there was also an increase of student demonstrators that took up their position outside the main entrance of Royal Holloway. They carried a large sign that said “Strike to Win” as well as other smaller signs. There were also chants of “No ifs, no buts, no USS cuts!”, which caught the attention of many passing cars, with some occasionally beeping in a show of solidarity. The cheers that emanated from students and lecturers alike as a result were palpable. Following a 77.6% majority voting for the Students’ Union to support the strikes, SU President Natasha Barrett, VP Welfare & Diversity Willow Wong and VP Education Clem Jones were in attendance among student demonstrators. Friday’s strike leader, Douglas Cowie, who is a lecturer in the English department, said that the strikes were “about securing a return to meaningful negotiation with Universities UK (UUK) so that we can preserve a defined benefit scheme and secure our futures.” Cowie further stated that while he is “prepared to be out here for the full four weeks”, he does not hope for the strikes to continue for the entire period as he “would like to be back teaching classes on Tuesday”. Cowie was pleased to see media outlets like the Financial Times as well as Sam Gymiah, Secretary of State for Universities and Science calling for an end to strike action by way of renegotiation, as “it seems like movement… in a profound way, which then needs to persuade the intentions of university bosses.” Cowie wanted to stress that they “are not here for fun”, they are there to “stand up for themselves”. Later in the day, analysis by Orbital Magazine highlighted that Sam Gymiah may have been too quick off the mark to tweet saying that he hopes UCU will call off the strikes. The tweet was on the back of an FT exclusive that UUK want to talk to UCU on Tuesday. UUK shortly afterwards explained that this does not mean that they will be re-entering the Joint Negotiating Committee over USS strikes. There are strikes planned for Monday February 26, Tuesday February 27 and Wednesday February 28. 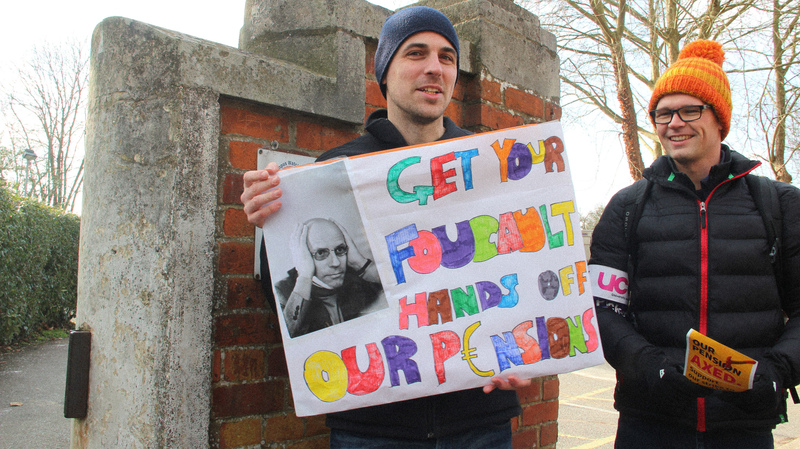 It has been reported that Universites UK (UUK) has asked the UCU to "engage in serious, meaningful talks on the future of the USS pension scheme" on February 27, which is a strike day. However, a UUK press release has said that "talks about the future of the scheme would not re-open the Joint Negotiating Committee decision made on January 23", meaning any talks about the scheme would not lead to it reversing the UUK position unless there is a proactive solution to the "£6.1 billion deficit" within the scheme. A solution is currently unlikely, effectively ending talks before they have begun. Most people expect that the strike action will continue, particularly here at Royal Holloway as Principal Paul Layzell has not overturned his position towards UUK. Incidentally, UCU has confirmed that they will be encouraging and taking strike action next week regardless of any sort of discussion with UUK.